here is the color challenge for this week .. click HERE to see all the gorgeous artwork ..
at first I thought what does this title mean ??? 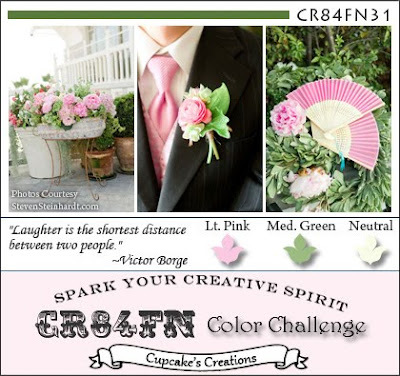 I think "CR84FN" is "create for fun .." clever huh !!! my first time entering this color challenge site..
loved the colors, so thought I would give it a go .. I had great fun creating this card ..
and I'll definitely be doing more of these challenges. thanks so much for leaving me such wonderful comments..
" they always bring a smile to my dial .. "
Your card is amazing! I loved all the details!! Heather everyone I know are having problems with the blog! I am here hoping that these problems are solved, because it gets complicated when we compromissos.I 'm am not able to post, it does not save! Very sweet of you! Use Google translator ... I know that the translator sometimes leaves the meaningless words, but that's okay, we know that we are all people with good intentions and everything is done with love! ! Wonderful card Heather. I like the look of the pins behind the butterfly. 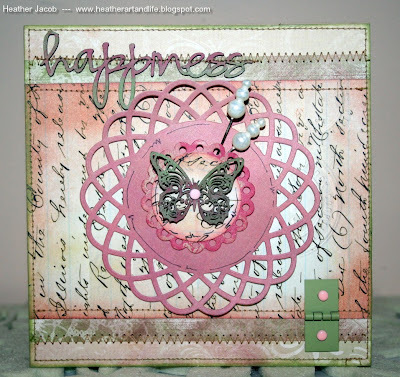 love all the die cuts you have used and the butterfly is stunning!! wonderful card ! Your butterfly is fantastic ! Wow..such a beautiful card! Love butterfly and the die cut piece of paper in the middle. The stitching is super too...you did a fab job with this challenge. Great card Heather and it is a wonderful colour combo! Wow Heather what a beautiful card love it to bits ...fab site just a bit of fun ha!!! Heather, this is so PRETTY! LOVE the color tones on the sentiment! THX for playing with us at CR84FN! Oh my goodness! What a stunning card Heather!! Beautiful! Lovely use of the colors. Love the shabby chic feel. Glad you joined us at CR84FN! awwww this is soooooo cute! LOVE the letters, the doly and that butterfly!! absolutely stunning!! I love the butterfly ... A wonderfull card !!! Wonderful card Heather. I just adore the little details that make up your lovely card, like the brad hinge and the quirky positioning of the text DP. So charming. Your card is beautiful. Love the butterfly on top of the doily. Very pretty card Heather...it's my 1st time with the challenge too!!! You did a super job!!! I liked your card. Well done!